NAMA, through the NTMA, has recruited staff with a diverse range of skills and experience from disciplines such as banking, finance, law, property, insolvency and planning, among others. In late 2011, the Board approved a revised organisational structure designed to respond effectively and dynamically to the challenges ahead. The reorganisation, which was implemented in April 2012, involved the restructuring of the Agency into five divisions. The number of NTMA staff assigned to NAMA was 331 at end-2013. Between inception and end-March 2014, 64 members of staff had resigned, including 29 resignations during 2013. The Asset Recovery division which, at end-December 2013, comprised 190 staff has three primary functions: strategy delivery, management of debtors and Receivers and maximising cashflow while minimising loss. Reviewing, on a regular basis, asset sale versus asset hold options, using discounted cash flow analysis. During 2013, Asset Recovery appointed property sector specialists for key portfolio sectors such as retail, offices, residential, hotels and land to assist case managers in preparing suitable strategies for assets under the control of debtors and Receivers. A Transaction Execution team was also formed to manage the increasing number of property portfolio sales and loan sales transactions across debtor connections. The NAMA-managed portfolio includes 217 debtor connections with original par debt of €61 billion (€55 billion of current par debt). All but three7 of these debtor connections are managed by 9 multidisciplinary Asset Recovery teams of 9/10 staff per team which engage directly with debtors in relation to business plans, credit applications and monitoring of targets and performance. Reviews of all debtor connection business plans have been completed. Invariably, NAMA sought significant amendments to the business plans as originally submitted and this process gave rise to difficult and intensive negotiations on contentious issues, for example Principal Dwelling House, early asset sales, reduction of overheads, reversal of previous asset transfers and securing charges over otherwise unencumbered assets. Implementation of NAMA-approved business plans is now well underway and this has been reflected in the level of cash generation to date. 7 Three substantial UK-based debtor connections are managed by NAMA's Asset Management team. The PI/Capita-managed portfolio includes 563 debtor connections with €13 billion of original par debt (€11.8 billion of current par debt). Following the liquidation of IBRC on 7 February 2013, Capita was appointed to provide primary and special services on the portfolio formerly managed on NAMA's behalf by IBRC. NAMA's enforcement activity (page 17) is overseen by a team of specialist insolvency practitioners (based in the Asset Recovery division) in conjunction with the Legal division. Both the NAMA-managed and PI/Capita-managed portfolios are supported by Asset Recovery Business Management which includes Asset Search, Policy and Portfolio Operations teams. TABLE 14: Breakdown of the PI/Capita-managed debt at end-2013. The Asset Management Division was engaged throughout 2013 in managing specific projects that had been identified as suitable for the team's specialist real estate and capital skills. These are key development schemes which are considered to be commercially viable based on current or prospective demand and pricing in two main locations, Dublin and London. In line with the team's processes, all projects are subject to robust 'sell-hold' interrogation tests at various stages in their evolution and this testing has meant that certain projects originally intended for development have instead been sold. In Ireland, significant progress was achieved during the year on planning issues associated with assets within Asset Management's scope. Applications are lodged or are being prepared for some 1,000 housing units in the Dublin region. The Asset Management division is supporting housing schemes that are currently under development in the Fingal and South Dublin County Council areas. Asset Management has engaged closely with local authorities, the DECLG, the National Transport Authority and other agencies, on national and local initiatives, including actively contributing to the Local Area Plan, Development Plan and SDZ processes. A particular focus of Asset Management has been the Dublin Docklands, where NAMA has security over substantial land holdings. Asset Management has been actively contributing to the SDZ process here, with the aim of creating an environment conducive to viable and sustainable commercial and residential development. Asset Management is also directly managing a number of specific development or redevelopment opportunities in Dublin's Docklands, where intensive intervention is creating opportunities for important and valuable outcomes. Outside of Ireland, Asset Management's focus has been on the London residential market where NAMA has provided funding for the construction of 5,000 units. Strong demand has meant that less than 1,000 of the units remain available for pre-sale and NAMA's development funding here will generate significant returns for Irish taxpayers. Asset Management also directly manages three of the Agency's larger debtor connections with aggregate par debt of €4 billion, principally secured by property located in London. The Asset Management division manages two NAMA initiatives: the provision of social housing (see pages 30 - 31) and the Deferred Payment Initiative (see page 21). In addition, during 2013, Asset Management launched a number of new mechanisms to enable NAMA to participate in asset enhancement and development, including setting up and participating in two Qualifying Investment Funds ('QIFs'), relating to assets in the Dublin Docklands. It is likely that similar initiatives will be pursued as market recovery expands. With its property market knowledge and experience, the Asset Management division will continue to be an important resource for NAMA, particularly given the imperative of addressing supply shortages in the Dublin residential and office sectors over the coming years. As one of a number of market activation initiatives, NAMA acquired a minority shareholding in a new QIF that was authorised by the Central Bank on 2 July 2013. The South Docks Fund is a sub-fund of Targeted Investment Opportunities plc, an umbrella fund with segregated liability between sub-funds. The co-investors in the QIF are Los Angeles-headquartered private equity firm, Oaktree Capital Management ('Oaktree'), Irish based property and construction group Bennett Group ('Bennett') and NAMA. Oaktree is the investment manager and Bennett is the property manager. The objective of the QIF investors is to combine their respective ownership of development lands in Dublin's South Docks, procure planning consents and proceed to develop the lands. NAMA also acquired a 20% shareholding in Gangkhar plc, a QIF fund set up a result of Project Aspen which was negotiated and is managed by the Asset Management team. NAMA will evaluate the benefit of participating in similar QIFs, should suitable opportunities arise. The Strategy and Communications Division is responsible for strategic analysis of the portfolio and for developing strategies for NAMA on how to obtain the best achievable return on the portfolio. Its functions include regular formal review of NAMA strategy and the design and implementation of new products. 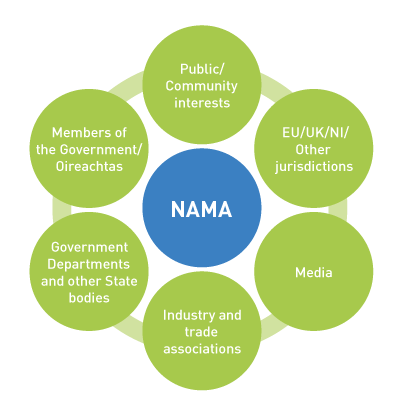 The division also has responsibility for managing NAMA's communications activity, including the co-ordination of NAMA's engagement with the media, State agencies and with other key NAMA stakeholders. The Strategic Planning team makes recommendations to the Executive and Board as to the most appropriate strategies for NAMA to pursue in the context of its statutory objectives. The team analyses portfolio data and developments and trends in the market with a view to formulating appropriate recommendations. It monitors and reports performance on a number of key elements of NAMA Strategy. inter-governmental discussions about public policy for the property and construction sectors and has a role in new product development. It is currently leading NAMA's engagement with the ESRI in a research programme which will produce research reports on topics related to future supply and demand for residential housing in Ireland. The NAMA Communications function is concerned with how best to communicate with stakeholders who have a legitimate interest in NAMA's activities to ensure that they are well informed about those activities and have a strong appreciation of the rationale behind initiatives undertaken by NAMA. NAMA's principal engagement is with debtors and potential purchasers of assets controlled by its debtors and Receivers and this engagement is conducted largely by the Asset Recovery and Asset Management teams. As the activities of NAMA debtors and Receivers have an impact on the wider economy and society, there is a diverse range of other stakeholders with an interest in those activities and that creates a corresponding obligation on NAMA to ensure that its perspective is communicated to those stakeholders. Given NAMA's scale and its potential impact on the Irish economy and society, public representatives, acting on behalf of their constituents, have a legitimate interest in NAMA's activities and NAMA, in turn, is keen to ensure that representatives are well informed about those activities, subject to commercial and banking law constraints and to the confidentiality provisions of the Act. NAMA engages with public representatives through a number of channels including appearances by the Chairman, the Chief Executive and senior executives at Oireachtas committees. It also provides a dedicated email channel which enables Oireachtas members to raise particular issues of concern to their constituents, for example, matters relating to unfinished estates, health and safety issues associated with derelict properties and assisting local community groups in identifying properties for their needs. A similar email channel is available to members of the Northern Ireland Assembly. NAMA also deals with issues of public concern through replies to Parliamentary Questions ('PQs') submitted to the Minister on NAMA matters (there were over 240 such PQs in 2013). More generally, NAMA seeks to provide as much information to the public as is possible given constraints imposed by commercial imperatives, banking confidentiality law and specific restrictions imposed by the Act on the release of confidential information (Sections 99 and 202). This is partly done through normal channels such as press statements, speeches, responses to press queries, website updates and information leaflets on particular topics (example below). NAMA also deals with a monthly average of about 130 email queries (through info@nama.ie) and an average of about 150 phone queries per month from members of the public. NAMA responds to each query within two business days. The Legal Division provides independent advice to the Board, the CEO and to NAMA business divisions on a range of legal issues that affect NAMA and its operations. At end-December 2013, it comprised of a team of 48 legal professionals and support staff with expertise in commercial and residential property, banking and finance, insolvency and litigation. The Legal Division provides legal advice and solutions to all NAMA business divisions. It is directly involved in all aspects of consensual and non-consensual strategies including: loan and property portfolio disposals; debt restructuring; asset management strategies; lending operations; enforcement and post-enforcement strategies; and litigation management across NAMA's total portfolio of par debt of €67 billion. The Legal Division also advises on the operational structures underpinning loan servicing by the PIs and NAMA's other master, primary and special servicers. Advice is also provided on NAMA's public procurement obligations. The Legal Division has provided strategic legal advice in identifying and managing legal risk on debt restructuring of more than €10 billion, property and loan sales of €12.4 billion and enforcements of €3 billion. The Legal Division provides legal advice and transactional services to the Asset Recovery and Asset Management teams in respect of the NAMA-managed portfolio of 217 debtor connections. Following the review of debtor business plans, Legal advises Asset Recovery and Asset Management on the implementation of NAMA's preferred strategy for each debtor connection including all new project funding, supervision of asset sales, restructuring of loans and security, loan sales, reversal of asset transfers, perfection of security and the taking of security over unencumbered assets. The Legal Division has assigned four dedicated teams to provide legal advice and transactional services to the Asset Recovery teams in respect of the Capita-managed portfolio of 294 debtor connections which transferred from IBRC management in August 2013. The Legal team has undertaken a critical review of strategy on all 294 connections and has made significant progress on implementing legal milestones arising from those agreed strategies. The Legal Division provides advice and policy guidance to Asset Recovery in respect of the PI-managed portfolio which includes 269 debtor connections managed by AIB and BOI and provides direction and guidance to the legal teams in those PIs on legal issues arising on that portfolio. The Legal Division is also involved in documenting service standards and resolving service issues with the PIs. The Legal Division advises the Board and NAMA Group companies on legal issues, corporate governance and compliance obligations. The Legal Division manages the governance structures of the NAMA SPVs, advises on the set up and establishment of all new SPVs and other on balance sheet transactions and advises on NAMA's debt funding programmes. The Legal Division manages all litigation initiated or defended by NAMA in Ireland and overseas jurisdictions, both in connection with its portfolio of loans and otherwise. During 2013, NAMA successfully dealt with a number of judicial review challenges. The value of judgements obtained in the Irish courts since inception is in excess of €2.3 billion. A summary of NAMA's litigation is included in Table 15 below. The Legal Division advised on all matters impacting NAMA arising from the liquidation of IBRC including the acquisition of the facility deed and floating charge form the Central Bank, the potential acquisition of loans from the IBRC SL, dealing with the impact of the closure of IBRC bank accounts, the transfer of loan servicing from IBRC to Capita and the procurement and negotiation of service agreements and operating models with new loan servicers. The Division advised on and implemented the delivery of social housing units to approved housing bodies through outright purchases and a long term leasing model. The Chief Financial Officer's direct areas of responsibility include Finance, Operations, Systems, Tax, Treasury and Audit & Risk. Preparation of Section 55 Quarterly Report and Accounts. Preparation of Annual IFRS Financial Statements. Liaison with external auditors regarding the year-end audit process. Monitoring and control of the organisation's operating costs. Advising on appropriate accounting, compliance and business administration considerations as part of new NAMA business initiatives (for example, the social housing initiative). Provision of advice on the set-up and establishment of new SPVs and other on-Balance Sheet transactions including equity investments and joint ventures. Performance of key reconciliations of the loan data provided by the PIs/Master Servicer. Management and control of loan data contained in the NAMA Loans Warehouse ('NLW') which provides source data for reporting and management information. Overseeing the recording of debtor transactions in both the PI and NAMA systems. Reporting of organisational key performance indicators ('KPIs') to Board, Board Committees and the Senior Executive Team. Preparation of regular management information for the NAMA business units. Preparation of external presentations for key NAMA investors and stakeholders. Preparation of annual budgets and other forecasts. Ongoing monitoring and reporting of forecast asset sales and associated cash flows. Management of the bi-annual impairment process. Supporting the NAMA business units on key projects and transactions. Development of NAMA's management information and business intelligence platform. Management of projects to support the ongoing development of the Finance function and participation in cross-functional projects. Implementation of Finance requirements in relation to the IBRC Integration Project. Maintenance and development of the NLW system. Liaison with the PIs, Master Servicer and internal stakeholders regarding the delivery of loan data and information requirements. Servicer management – Oversight and relationship management of NAMA's service providers including the PIs and Capita (as Primary and Master Servicer). • Overseeing the re-establishment of normal banking activities following the liquidation of IBRC. • Implementation of an operating model for the new service provider to the IBRC- administered part of NAMA's original book. • Enhancing visibility and control of rental income generated by secured assets. • Provision of internal operational services to support the Agency in meeting its objectives including settlement of major transactions. • Management of cash advances to debtors for capital and operational expenses. • Opening of debtor current accounts. • Data quality of key NAMA systems. • Classification and analysis of all cash receipts.  • Monitoring of non-disposal income receipts against budget. • Collation and recording of asset disposals. The development, management and implementation of all NAMA's systems. The focus of work in 2014 is on the ongoing integration of NAMA core systems to deliver an integrated systems platform to support the NAMA business users and enhancing the systems to facilitate the take-on of data from IBRC. Oversight of the data stored within NAMA's systems by ensuring appropriate procedures are in place for requesting and granting appropriate systems access; and for executing regular reviews of access that is in place. Managing the organisation's tax compliance obligations. Designing, implementing and overseeing structures and protocols, both within NAMA and the PIs, to ensure that debtor/Receiver taxation issues are appropriately considered as part of property and loan transactions. Advising on appropriate tax planning and structural considerations as part of new NAMA business initiatives (for example joint ventures). Management of NAMA's day-to-day funding and liquidity requirements. Balance sheet asset and liability management (ALM), including management of currency and interest rate risks. Monitoring and forecasting NAMA's medium and long-term liquidity. Management of NAMA's Senior Bond issuances and redemptions. The design and implementation of the NAMA Risk Management Framework. Providing independent assessment of, and challenge to, the adequacy of the control environment and critical organisation processes (for example impairment). Supporting the NAMA CFO to ensure that NAMA operates within Board-approved risk limits and tolerances. Coordination of the internal and external audit activities across NAMA, PIs and Master Servicer. Monitoring and reporting to the Audit Committee and Board on progress in addressing actions highlighted in audit findings. Oversight of NAMA's Quality Assurance function.